At the ToorCon hacker conference in San Diego Saturday, Ossmann and his research partner Jared Boone plan to unveil a beta version of the HackRF Jawbreaker, the latest model of the wireless Swiss-army knife tools known as software-defined radios. It grants any computer programmer the ability to develop new ways to interact with radio waves. 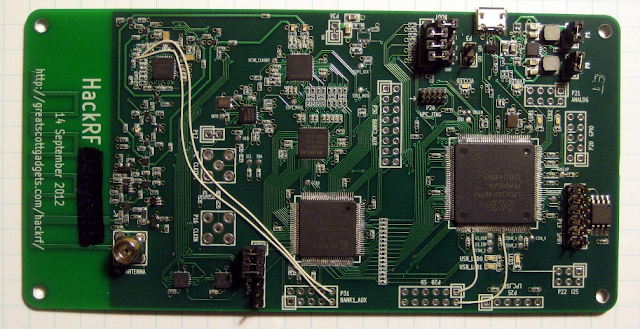 HackRF, a software radio peripheral. Software radio or Software Defined Radio (SDR) is the application of Digital Signal Processing (DSP) to radio waveforms. It is analogous to the software-based digital audio techniques that became popular a couple of decades ago. The device has the ability to transmit and receive over a wide range of frequencies, covering a huge number of commercial devices. Once can Intercepting and Reversing engineer received frequencies. Just like a sound card in a computer digitizes audio waveforms, a software radio peripheral digitizes radio waveforms. It's like a very fast sound card with the speaker and microphone replaced by an antenna. A single software radio platform can be used to implement virtually any wireless technology (Bluetooth, GSM, ZigBee, etc.). "Personally, I want a single device that can fit in my laptop bag, that doesn't require a bulky power supply, and that I can use to hack on whatever wireless systems I encounter. I'm hoping it will be about the size of a portable USB hard drive, and it will probably end up with a retail price in the neighborhood of $300, higher than technology-specific solutions like Ubertooth One but much less than any software radio transceiver on the market today." Developer said. HackRF will be open source (available on GitHub), portable, affordable, and will be capable of both transmitting and receiving radio signals. With HackRF in the hands of hackers no wireless signal would remain secure just by virtue of using a unique, unfamiliar frequency.